Malaysian startup CurrenSeek is a location-based currency exchange app that helps travellers compare and locate the moneychangers with the best rates. The company claims that travellers can save up to 200% of their travel money using the service. Created by Intuitive Asset Sdn Bhd, CurrenSeek was launched in April this year and lets you discover and compare street rates – not wholesale inter-bank rates – and is social media friendly, meaning that you can share these rates, locations and directions to your friends. When you open up the app, a map shows you the various exchanges in the area. Then, you need to enter the amount you want to convert and the currency. 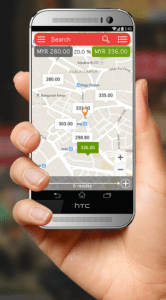 The app will show you a list of exchange providers nearby and their rates. You can compare these rates, sort the providers by their rates or location and distance, as well as get details on their selected money exchange outlet and get directions to the location. As CurrenSeek is a community-based app, you can contribute by sharing the latest rates with fellow travelers by posting a picture of the rate board or keying in the details, and reviewing the outlet. Currently, CurrenSeek is solely available on Android, although the team is planning on releasing an iOS version. The app covers central Kuala Lumpur area and KLIA 1 and 2, and supports ten currencies: USD, GBP, AUD, SGD, EUR, RMB, TWD, KRW, JPY and IDR. The company said it is working towards expanding to include more areas and currencies. Apart from CurrenSeek, Malaysia has many online services that allows users keep track of their finances or help them manage their money better. iMoney is reportedly the leading financial comparison website in the country. In addition to its comparison service for banking and insurance products, iMoney provides users with useful tips and information about applying for loans, credit cards, car insurance, fixed deposit, and more. In addition to Malaysia, the iMoney Group also operates local portals in the Philippines, Singapore and Indonesia. Similarly, SaveMoney is an independent online finance advice magazine that provides with fresh updates with the best deals in the market, a set of comparison tools, as well as financial guides. Another website is CompareHero, a service that focuses on the comparison of credit cards, loans, insurance policies, and even mobile and Internet plans. According to managing director Gerald Eder, the idea of CompareHero emerged from the lack of important financial information such as medical insurance policies.